Mix all the salad ingredients together. Toss them well. Mix all the dressing ingredients. Whisk this mixture well for 2-3 minutes so that all the ingredients emulsify properly. Add the dressing to the salad. Mix it well. Add sea salt to the mixture as per the requirement. 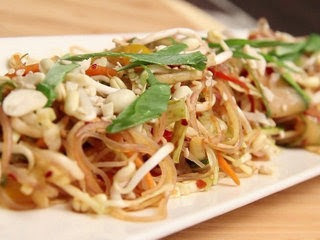 Garnish the salad with bean sprouts, shallot leaves, toasted peanuts and sesame seeds. Your salad is ready to serve.